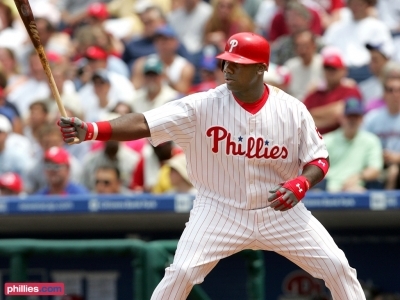 Ruban Amaro Jr. announced after the Phillies loss to the Met's Thursday night that Ryan Howard is likely to join the team and start at first base Friday night against the Atlanta Braves at Citizen's Bank Park. Howard has been on the disabled list the entire season since suffering a torn Achilles tendon in the final game last post season. He will be evaluated a final time Friday afternoon before the decision is made. Howard played a full nine innings Thursday for Triple-A Lehigh Valley in Bethlehem and went 2-3 with an RBI. He split his 7 game rehab stint between Class A Lakewood and Lehigh Valley and went 10-20 with 2 2Bs, 1 HR, and 10 RBIs. The three minor league teams are all on the road this weekend and this series is the last before the All-Star break, making it a reasonable time to bring Howard to the team. Even if all doesn't go well, he'll still have the time off next week. Just like Utley, Howard won't play everyday to start off. Anything to jumps tart this team for the second half of the season.